SPECIFICATIONS: Seat Size: 17.75" x 14.75". Seat Height: 18.25" - 22.25". Base Length: 48" - 49" (Extra Long) (From outside-leg tip to outside-leg tip). Base Depth: 18.25" - 20". Max Tub Clearance: 18.5". Back Height from Floor: 32" - 36.25". Sliding Distance: 24". Weight Capacity: 300 lbs. (Dimensions are approximate and subject to change without notice; generally within ±0.75" tolerance). SHORTER LENGTHS AVAILABLE: #77211 (Base Length 39"-40") & #77281 (Base Length 43"-44"). OPTIONAL ARMREST AVAILABLE: #75003 (Single) - (NOTE: Armrests are not designed to bear body weight. They are only intended to rest your hands or arms on). Please measure your bathroom and bathtub carefully to make sure this product will fit your specific needs. This is a non-returnable hygiene item and cannot be returned once opened. SAFE & RELIABLE: Our innovative Sliding Transfer Bench (77291) by Eagle Health Supplies makes getting into and out of the bathtub easier, safer, and will give you or your loved ones a sense of confidence, safety, and steadiness in the bathroom. It can give you the independence and dignity to bathe yourself without assistance. Or it can help you or caregivers assist your loved ones in the bathroom. 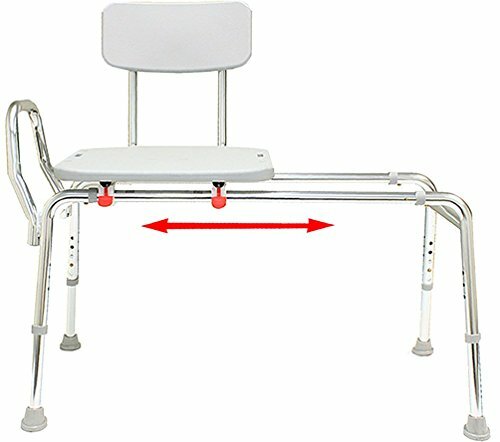 SLIDING: Seat glides over durable, polished aluminum-tube sliding rails. LOCKS SECURELY: Seat locks at each end of the sliding rails. COMFORTABLE FIT: Comfortable molded plastic seat and back with textured finish and seat drainage holes. STRONG: Built with rust-proof, lightweight, high-strength aluminum frame. EASY TO ASSEMBLE: No tools required. HEIGHT ADJUSTABLE: To fit the user and tub clearance. HIGH WEIGHT CAPACITY (300 lbs).